It’s not too early to sign up for your place in the 2018 Santa Parade! The Parade will be held on December 1st. 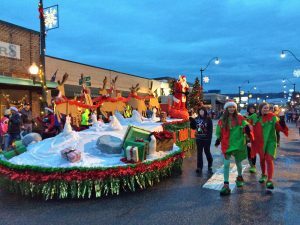 You can apply to be in Sumner’s parade at 3 pm, Puyallup’s parade at 5 pm… or both! Fee is $75 for two vehicles for commercial entries. There is no fee for school, club, or non-profit entries nor for commercial entries sponsoring a school, club or non-profit. All applications this year will be submitted online through the Puyallup Main Street Association website. Completed entries must be received by November 10th.